MY COMPOSER! 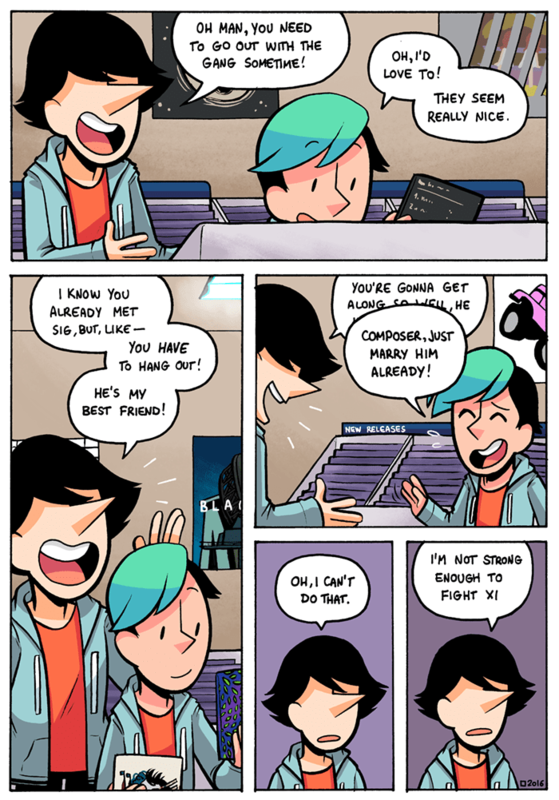 Your comic is so cute and adorable and fantastic and wonderful! Wow wow wow! My most favorite thing about your comic is the character Rho. Mostly because he is just such a hyper fun guy and I think I would also like Dog & Fries. I also really love love Aleph!! I want to be their friend. Your whole cast is lovely and such a great friend family! I think you did a wonderful job writing Sigma as a character who is blind. I learned a lot about blind accommodations and braille while reading. I also really enjoy seeing his relationship with Xi develop. It is so sweet and romantic to see a couple get more serious and move in together! AHHH! I’m dying it is so cute and they are so cute together. RHO GIVE BACK THE KEYS!!! Your art and colors are super crisp as well! You have done a great job designing and writing adorable characters readers can relate to. Your whole cast is so lovable and complex! I can not wait to read more and more until your comic eventually ends! Then, I can not wait to read your new project! There is so much more I could write. You are truly a fantastic story teller and artist! All Images Copyright Constanza Yovaniniz. Found on: I can not remember but twitter?